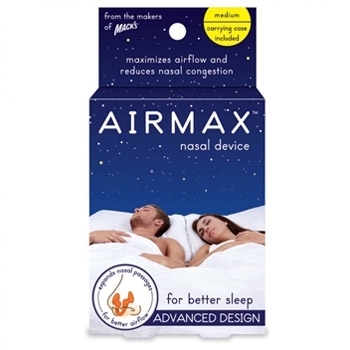 AIRMAX™ is an example of a non-surgical, non-invasive treatment for snoring. AIRMAX™ can help in cases of light sleep apnea/OSA and it can be used in combination with an oxygen mask (e.g. CPAP) and has been proven to increase compliance for CPAP users. AIRMAX™ efficacy has been proven in clinical studies. AIRMAX™ helps patients suffering from nasal congestion to breathe more freely through the nose. Its efficacy has been proven in clinical studies. Clean the device with water before and after use. When using AIRMAX™ for the first time, we recommend the use of a mirror to help you position the device. You should use the AIRMAX™ device each night for at least 2 consecutive weeks, as it may take time for your nose to become accustomed to the shape of the AIRMAX™ device. The AIRMAX™ device can be cleaned with water and mild soap. Each AIRMAX™ device should only be used by one person to prevent transfer of diseases like the common cold. If you have trouble placing the AIRMAX™ device in your nose because your nose is not symmetrical, you should not use it. If, after placement of device, you do not notice improvement in breathing, we advise you seek the advice of an Ear, Nose and Throat (ENT) doctor. If, after regular use of the AIRMAX™ device, your nasal passages become irritated, this could be an allergic reaction to the medical grade plastic. Discontinue use and see a physician if condition persists. To date, no allergic reactions have been reported. AIRMAX™ is not suitable for children under the age of 12. Keep out of reach of younger children to prevent choking. I have a deviated septum and while its not a perfect solution it does improve my sleep overall, The device is soft and firm where necessary so personally its comfortable to use though you might require some adjustments throughout the night for better positioning within the nostril cavity, overall its well worth the purchase as there seems to be a 30-35% increase in airflow which can make a huge difference to sleep quality. A few remarks or suggestions for the manufacturer would be a longer bridge between the two pad like surfaces that part the nostrils, I believe its 6mm, however my septum is rather closed and a wider bridge would be more beneficial to me and others with varying degrees of nostril circumference, a wide bridge would also make for a tighter fit and therefore the device will move less throughout the night and the need for adjustment will diminish. 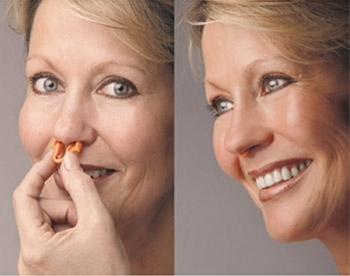 A wider bridge would also make it possible to create a device for use in only one nostril as it wouldn't need support from the other half of the device to hold its position since it will be tighter and more rigid in its place, this is great since a deviated septum only occurs in one nostril typically and there is no need to obstruct a healthy nostril with any inserts. A bit on the small side to be effective for my problem.